Images from We Are The South campaign. What does it mean to “queer” racial justice? For Nayeli Perez-Huerta, Jaison Gardner, and Parker T. Hurley, the leaders of the Queering Racial Justice Organizing in the South workshop at Race Forward’s Facing Race 2014 conference, it is a strategy of building power for people of color by complicating the black/white binary. This means talking about intersection in racial justice work, and using intersectionality as a force for justice and liberation. It means privileging “non-dominant narrative identities,” opening up space for multiple and shifting identities through story-sharing, finding commonalities through systems thinking, and not having to fight alone. 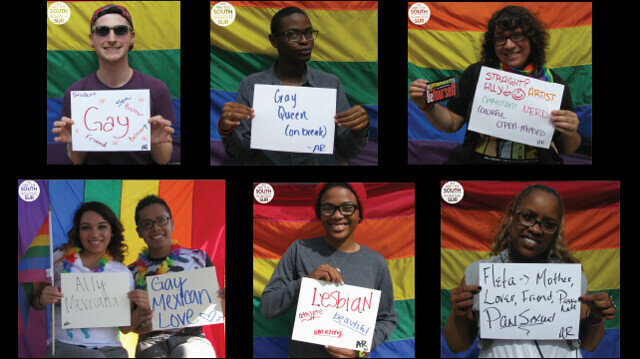 What do the racial justice and queer movements share? A fight against criminalization, violence, imprisonment, deportation, dehumanization and division – the very same system is beneath all of these forces. They share a fight against the disappearance of public space, for economic justice, against disposability and death – by suicide, through hate crimes, on border crossings and in prisons – and a fight for life. Ultimately they share a fight against binaries – black/white, legal/”illegal”, heterosexual/homosexual, male/female – which contort, police, silence and dehumanize and are at the core of the all-too-human process of sorting other people into hierarchies of value. Having established common ground over the past few years– and common social and structural sources of oppression – the question for these movements together now becomes how to use their differences as sources of radical possibility. In the South, an area many progressives both pathologize and see as a lost cause, the racial justice movement has opened its doors to queer lives in powerful ways. But the reverse can’t be said about the LGBTQ movement. What really became clear to me in this workshop is just how much the LGBTQ movement needs a critical examination through the lens of racial justice. Only 3% of funds from Gay Inc. – mainstream gay organizations like GLAAD and the Human Rights Campaign – are directed at work in the South. This is despite the fact that over 2/3 of black LGBTQ families live in that region of the country. It is a reminder that even in seemingly progressive circles, black lives don’t matter in the ways that white ones do. And more deeply, LGBTQ organizing is very white and “Anglo” – not just in terms of the color of the movement but in terms of the issues they privilege. As one audience member put it, the movement remains fundamentally focused on causes that increase access to “whiteness” and the institutions of white supremacy – gay marriage being the most obvious example. Mainstream images of “the good life” remain inseparable from the historic privileging of white and heterosexual lifestyles. The fact that Gay Inc., and nonprofits in general, don’t reign supreme in the South like they do on the coasts is seen as an opportunity. Local activists don’t want mainstream, predominantly white organizations cashing up and heading south to talk to communities of color. Bishop Tonyia Rawls drew an important distinction between “organizing in the South” and “Southern organizing”. At its core, the latter requires intersectionality. In the South, there’s no other way to organize: every movement has to address faith and religion, and every movement has to address poverty. As a result, there are far fewer hard (and straight) lines between issues. Southern organizing is not campaign-driven, but based on relationships which transcend specific efforts and which are built with a view to the larger endgame of liberation. In this model, which moves beyond transactional, finance-based and siloed organzing, the South has something profound and transformative to offer progressive movements in other regions and at other scales.